Mentioned is the way you can write Braille Teacher for the Blind Resume Template . 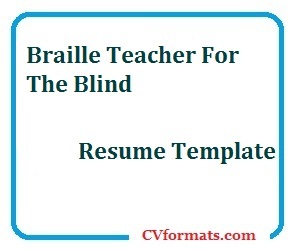 People looking for jobs can easily download these Braille Teacher for the Blind Resume Template in word or pdf format or just view it online to copy and paste. Cover letter of Braille Teacher for the Blind Resume Template is also available. Just change the name , address , qualification and experience and your Braille Teacher for the Blind Resume Template is ready. • Modify and develop typical elementary curriculum to accommodate special-needs students using the appropriate pedagogical methodologies and technologies for the educating blind students. • Maximize heightened aural sensory of blind children in the teaching process by using a variety of spoken literatures and phonetics in starting to teach Braille’s sensory learning methods. • Meet with parents and guardians to appraise progress of their children and reassess learning priorities. • Maintain and update accurate student’s extracurricular and scholastic performance. 2008 – 2011: BS Psychology, AIR University, Lahore.